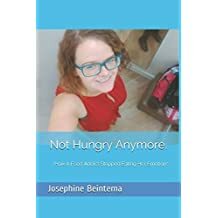 For those looking for somewhere to start on their New Year’s resolutions, Not Hungry Anymore is about to go on sale in Amazon! I’m going to put the Kindle edition out for just .99 USD! This is your chance to get the entire book at a fraction of the price! When I was 22 years old it was like I had the average seventh grade child strapped to my back. I was 110 lbs over by ideal weight. Some adults don’t get to be 110 lbs and here I was lugging that weight around every day. I had a hard time walking up stairs. I was out of breath, out of shape and headed for serious health issues. Are you lugging around a kindergartener? Or maybe an eight grader? Or perhaps a linebacker from the NFL? Your life and your weight can change. I lost 100 lbs and I intend to keep it off! Part life story, part how-to guide, follow my journey from childhood obesity to health scare to finally figuring out what it really takes to take and keep myself at a healthy weight. For years I struggled and then I finally found what really works and it’s not pills, shakes, or crazy eliminate food types diets. You can lose weight on any diet. You can lose weight eating only junk food if you really wanted. It’s not healthy and in the long run, you’re not going to keep the weight off. In fact, 95% of people who lose any significant amount of weight end up putting it all back on within 5 years. Why? Because dieting doesn’t address your mind. It doesn’t realize that there is a reason of why you got to be obese/fat in the first place! But don’t worry. You and I, we can be part of the 5% that do keep it off! Are you a food addict? I know I am! and I’m going to have to live with that for the rest of my life. I’m addicted to food just like a smoker is addicted to cigarettes or an alcoholic to alcohol. Yet I need to eat food to live. So in this book I’ve compiled helpful steps that have stopped me from going into the cupboard or fridge. I’ve also delved into my mind and come up with what really motivates me to eat and how I can exchange negative coping strategies for positive ones. By doing some simple life changes, I’ve lost an amazing amount of weight in the past year and I full intend to keep it off using the exercises listed in this book. You can do the same! So pick up this book, give it a read, fill out the writing exercises, turn to it for advise when you need help and come join me on the journey! You can do it. You can be a slimmer, healthier, happier you! Josephine is a self-publishing indie author. She is a Christian, an author, public speaker, aunt and great-aunt, and loves travelling with her Boston Terrier Bean.